This is the view of our driveway right now. Needless to say, we are “trapped” in our homes. 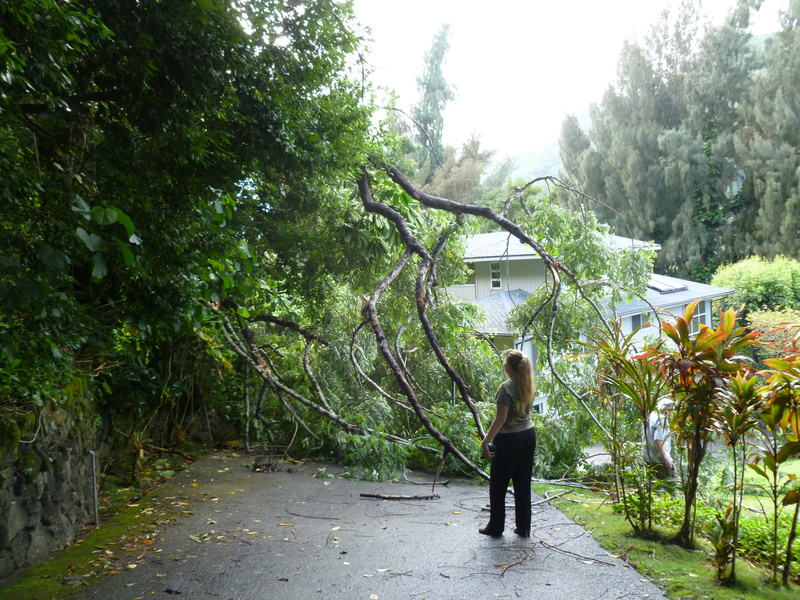 We live in a horizontal condominium (four single family homes) called Pali Hai in Nuuanu and last night a tree fell across the common driveway and, well, here it is. We are hoping a tree trimming company will be here soon to clear it out. That's my husband Jerry on the right and our neighbor on the left. It was so weird! At about 3 a.m., around the time the tsunami was expected to hit, we woke up to some crackling sounds. We looked out the bedroom window and went out on the deck to try to see what was causing the crackling. It was pitch black and we couldn’t see anything. We kept hearing cracks, and then pops, for several minutes. It sounded electrical, which was pretty alarming. Then we heard a series of pop, pop, pops, rather like the end of a string of firecrackers. Then silence. We were really afraid it was something electric, from the sounds of it. 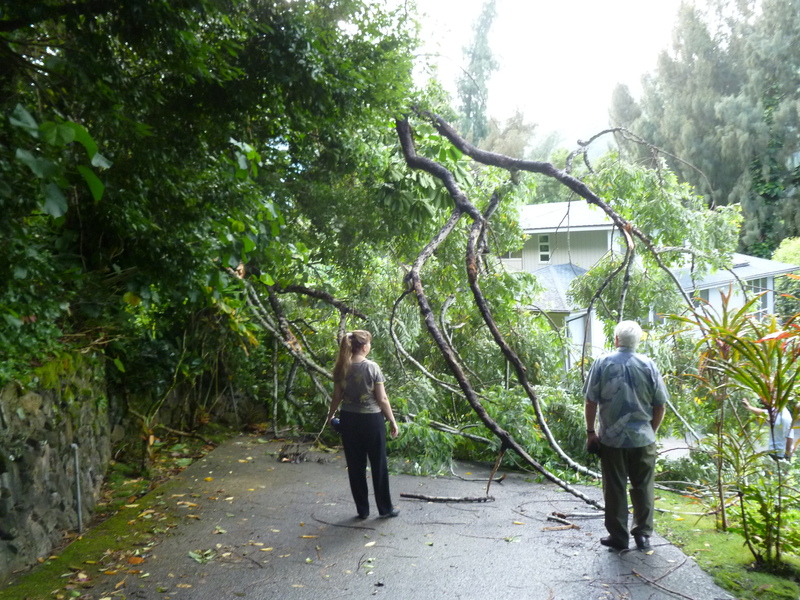 We couldn’t see or hear anything more so we went back to sleep and it wasn’t until Jerry tried to go out this morning that we discovered a tree had fallen and the driveway was completely blocked. It’s not connected in any way with the tsunami – just a coincidence. This entry was posted in Home Style. Bookmark the permalink. Holy cow! Glad to see that no one was hurt. Nope. We’re fine. Just a little excitement…. Glad to see you and Jerry are okay!